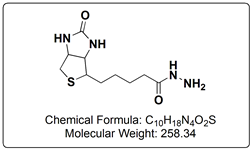 Biotin-Hydrazide | CAS 666640-86-6 - CovaChem - CovaChem, LLC. Biotin-Hydrazide is a protein modification reagent commonly used to target glycans and glycoproteins. Biotin-Hydrazide efficiently reacts with sodium periodate (CovaChem 11310-25) oxidized sugar residues or aldehydes by forming stable hydrazone linkages under mild reaction conditions at pH values of 5 to 7.